Lotus Moon Qi Gong is a set of women-specific Qi Gong practices. Through utilising Yin Qi and Heart energy it is possible for women to move quickly through the internal practices of the Daoists. There is ancient saying which says ‘a man can cultivate Dao in a mere nine years of dedicated practice, women can do it in six’. In order for this to be the case women have to work with the powerful Yin energies which they have inside of them. The Lotus Moon Qi Gong exercises are used in conjunction with non-gender specific practices to assist a woman in moving through her personal Nei Gong journey. This is the process of internal evolution inherent within the Daoist arts. The Nei Gong process works to help a woman establish a strong foundation in their health before opening up the energy body and increasing Qi flow. All of this becomes a platform from which old emotional hurts are shed and true consciousness can shine through. A stage in the practice compared to the ‘blossoming of a lotus flower beneath a radiant moon’ within the female Daoist tradition. Lotus Moon practices include energy work for the Uterus, the Heart, cleansing the Breasts of pathogens and connecting a woman into the cycles of the moon. Meditation includes spiritual work with Mudra’s which women can use very early on in their training compared to men. An introduction to the foundations of Lotus Moon Qi Gong as well as the Nei Gong process is given within Roni’s book ‘Daoist Nei Gong for Women – The Art of the Lotus and the Moon’. Those wishing to move deeper into their Qi Gong training will begin to practice more advanced Nei Gong methods at some stage. Nei Gong translates as meaning ‘Internal Work’ and is a systematic method of converting our essence (Jing), energy (Qi) and spirit (Shen) so that we may begin to move towards direct connection with the realm of the divine. This is the original process inherent within all Daoist practices and sadly an often missing aspect of many Qi Gong practitioners art. Thorough the use of direct transmission and hands-on techniques, Roni will lead those ready, deeper into their energetic practice through the teachings of Nei Gong. This involves the awakening of the long dormant energy body so that students can experience an increased flow of energetic movement within their meridian system. This helps various stagnant energies to leave the body resulting in higher degrees of health. Roni has trained extensively with Damo Mitchell (author of Daoist Nei Gong) in the techniques of Nei Gong and now teaches them within the Lotus Moon Spiritual Arts School. One energy was already there. Like gold, brighter as it’s refined. Stay firm by the door of total mastery. The gentle firing is warm. In Daoist philosophy we are all beings who are comprised of three bodies; the physical, the energetic and the spiritual. We exist within the vast universe which is generally seen as the ‘large Heaven’ or simply macrocosm. The human body is often called the ‘small Heaven’ or the microcosm. Everything in the universe operates according to cycles. The macrocosmic cycles are matched within the microcosm of our body. We are connected to our environment in ways we don’t often think about; energetically and spiritually. Through our physical and energetic centre runs a deep, powerful energetic meridian called the Chong Mai (Thrusting meridian). This is the channel which extends up into the cosmos. It has the potential to connect us to planetary shifts and to higher levels of consciousness. When this channel begins to open up through spiritual practice, we become naturally more intuitive and aware of energetic shifts around us. 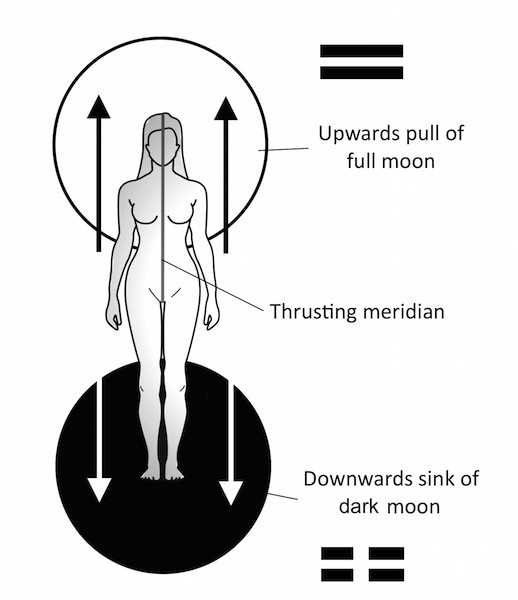 The planetary body which women are mostly connected to is the moon, this is because, just as women do, it has a Yin quality to its energy. Men are more governed by the sun, which is Yang. The waxing and the waning of the moon therefore has a greater effect on women than the sun. It has a particularly strong influence upon the energy of the Chong Mai. The Chong mai is often also called “the Sea of Blood”. When the moon is full, the energy in the environment as well as us is pulled upwards. This means there will be more energy in the head around the time of the full moon. Classically therapies such as acupuncture would not be applied to the head or face around the full moon. During the Dark moon, the energy drops down towards the ground, and generally our energy should be lower during these periods. It is also a natural time for menstruation to begin. This is not often the case in modern living, our rhythms from the sun and moon have become confused. There are Nei Gong exercises that can be practiced to increase your connection with the moon and to harmonise yourself with its energetic shifts. Menstruation is often seen as a bit of an inconvenience and many women use pills or implants that changes the natural cycle or completely stop it. But the natural cycle of your menstruation is important because it helps cleanse your body and spirit. During our life, especially in younger years, things causes us to experience big emotional swings and tensions that in turn cause blockages in the physical and energy body. In Chinese medicine the menstruation helps to clear these blockages. In Daoism the monthly cleanse of the blood and the spirit is to prepare women for their second Spring, the start of their age of spiritual maturity. This is the time when the menstrual blood stops. In the west menopause is often treated with an air of shame. In fact it should not be a negative thing at all. During this age the woman, if she has managed to cultivate herself and her spirit, should be more emotionally balanced and mentally strong. This is the time where it is possible to naturally move deeper into meditation and spirituality. Inherent strengths of the feminine spirit will be able to strengthen, such as increased intuition and further opening of the Heart. In order to ensure that this all happens as it should and a woman moves through the cycles of her life healthily we use lunar gazing. This is a simple Shen Gong exercise method which helps us connect to the cycles of the moon and integrate its Yin energy into our being. One of the Qi Gong sets we use within the Lotus Moon Spiritual Arts school is the Heart-Diamond Gong practice. They are a little different from many of the other exercises utilised within our school as they actually originate from within the Chan Buddhist line. They are a set developed at a time when Buddhism and Daoism were enthusiastically exchanging methods and ideas. Taught to Roni Edlund by Damo Mitchell of the Lotus Nei Gong School of Daoist Arts they were exercises used by Damo when, during his internal development, he was working on opening and expanding the energetic field around the middle Dan Tien. These exercise use a combination of bodily movements, Mudra’s and steady ‘listening’ with the mind in order to give the Heart’s field space to open up and expand outwards. The Mudra’s establish a particular frequency within this field and this in turn leads a practitioner towards a state of inner stillness. 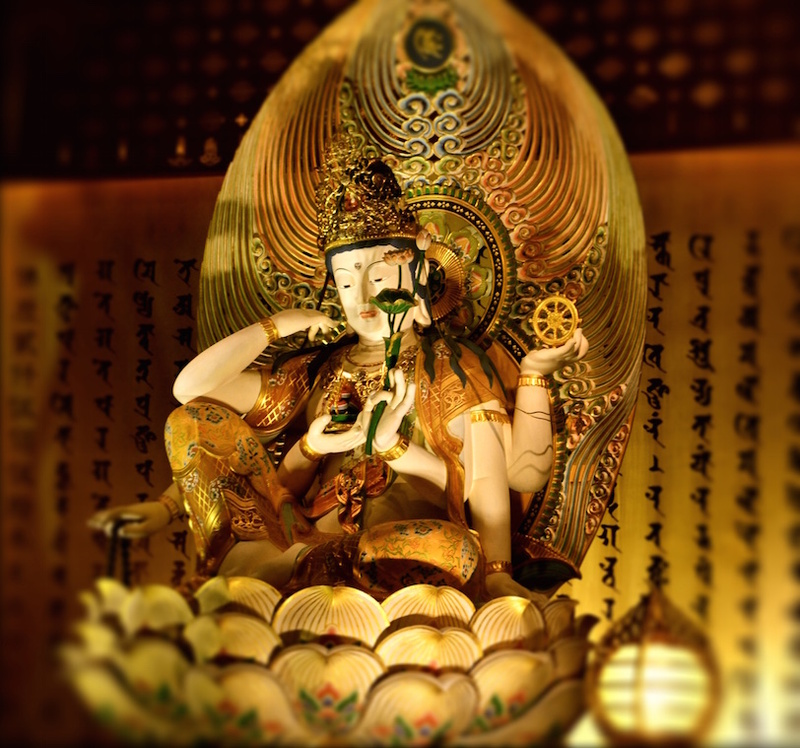 Performed either standing or sitting, the Heart Diamond Gong are useful form women aiming to awaken the middle Dan Tien, the key storehouse for Jing within the energetic body. They are an intermediate level Qi Gong set in difficulty and not generally recommended for beginners. Roni Edlund will teach the Diamond Heart Gong exercises on weekend long courses to women who have already established a strong foundation in their practice. They take time to connect with and a certain level of skills with regards to contacting the energetic system and controlling the awareness. Almost every spiritual tradition around the world uses sound in some way or another. In some traditions sacred phrases are chanted, in others prayers are said out loud but in Daoism we mainly focus upon the use of sacred syllables. Within medical Qi Gong these practices became the basis for the development of the commonly practiced ‘six healing sounds’ whereas within alchemical Nei Gong we use sounds in a slightly different manner. Daoism has known for centuries that which science has only just woken up to. They understood that sat beyond the realm of matter was the realm of energy, look deep enough into the physical world and we find little but space and vibration. The Daoist law of energy states that ‘nothing rests; everything moves; every-thing vibrates.’ The denser the vibration the closer we are to physical matter, the higher the vibration the cloer we are to the realm of spirit. Within the range of frequencies which make up the spectrum of Jing, Qi and Shen we also have the various emotional and psychological layers of the Heart-Mind. In short, feelings such as fear and sadness exist at the lower end of the psycho-emotional spectrum whilst feelings of joy, empathy and love exist at the higher ends of the range. Alongside the various physical, electrical and chemical signals that move through our each second there are also energetic vibration frequencies which carry with them important spiritual information. It is this source of information which serves to connect the mind and the body via the conduit of the meridian system. Understanding this is the key to understanding many aspects of alchemical Daoism. For example, if a frequency is raised high enough then it would reach the frequency of light, move into the visible spectrum and thus manifest as the white light of Shen or illumination discussed within many spiritual traditions. The law of resonance states that if two frequencies exist within the same space, the lower will raise to meet the higher. This is used within our practice as we generate sound and tones aimed at lifting the frequency of an energetic centre up to match that of the sacred syllable being sung out loud. As the sound is issued it corrects any imbalance or lowering of an energetic centre’s frequency and this has the effect of ‘opening’ up the energetic body. These openings then cause our physical matter to vibrate differently, this raises the frequency of emotional energy within the body and thus our spirits are raised. Within the Lotus Moon Spiritual Arts school we use various sacred sounds from within the Daoist tradition as a form of energetic and spiritual Qi Gong. The sitting practices of the Daoists are generally known as either Nei Dan meaning ‘internal alchemy’ or Zouwang meaning ‘sitting and forgetting’. As with other forms of meditation the methods taught within the Daoist tradition aim to lead a practitioner towards inner stillness. This is achieved through a systematic transference of Jing into Qi and then into Shen. As these energetic ‘substances’ are refined they help change the nature of mind and allow true consciousness to shine forth. Less well known is the women-specific sitting practice known as Nu-Dan or ‘female alchemy’. Daoist meditation is a powerful transformative tool which can be used by anybody willing to set aside a little time each day. Through a combination of sitting, standing, moving and laying exercises a step-by-step process is worked through which helps to settle and condition the spirit of the practitioner. The process is very different for men and women due to the different nature of their energy bodies. Note that many of the terms within alchemy can be confusing at first as metaphors are used within ancient classics to hide the real meanings. No need to worry as when these metaphors are explained, Nei Dan becomes much simpler! Within the Lotus Moon Spiritual Arts school we teach various sitting alchemical practices. As well as this many of the alchemical principles of Daoism are integrated into the rest of our exercises and practices. Taijquan or Tai Chi is practiced by countless people across the world each and every day. This moving form of exercise derived from the Daoist tradition has caught the imagination of people from all cultures as they experience the many physical and psychological benefits which it brings. Bringing together the principles of Chinese medicine and internal alchemy into one system along with traditional martial arts makes Taijiquan a complete practice for realising the nature of the Daoist tradition. Sadly, it is often the case that women are overlooked within the internal martial arts world. They are often ignored in favour of men or seen as ‘not as important’ within a class. Overly matcho character traits that come up during partner exercises mean that women feel excluded or disinterested. On top of this popular media tends to depict women using martial arts classes as a form of fitness; often they are shown in skimpy outfits and a pair of bright pink boxing gloves! This is a true shame as Taiji training can help a woman to get in touch with her body, learn how to utilise the principles of Yin and Yang in a creative manner and how to work with her own inherent strengths to develop self confidence as well as self defence skills. Within the Lotus Moon Spiritual Arts school we teach the Yang system of Taijiquan as passed onto Roni by her partner Damo Mitchell who is the head of the Lotus Nei Gong School of Daoist Arts. We teach the entire classical syllabus with nothing watered down or taken out. The origins of Baguazhang are shrouded in mystery; its creation is attributed to different legendary characters and Daoist sects depending upon who you ask. Whatever the truth we do know several things: Firstly it is a fairly recently created internal martial art compared to some other systems, secondly it was developed from the original circle walking exercises of the ancient Wu shamans and thirdly that a man named Dong Hai Jun introduced it to the public resulting in the spread of Baguazhang throughout China. The circle walking practices of Daoism stretch right back into antiquity. These energetic exercises were designed to fully awaken the practitioners energy body and elevate their consciousness. Recognising the internal potential of circle walking, the originator of Baguazhang (whoever that may have been) began to add short martial sequences into the practice creating an internal martial art that seamlessly integrated spiritual cultivation with effective combat techniques. The spiralling energies originally utilised for spiritual cultivation where directed out towards the extremities enabling controlled bursts of internal force to be projected into an opponent. The key form of Baguazhang is based around eight short martial sequences performed whilst walking the circle. each of these sequences is known as a ‘palm change’ and each of these is in turn based upon one of the eight generative Gua (Trigrams) of the classical Daoist text known as the Yi Jing (I Ching). Within the Lotus Moon Spiritual Arts school we teach the Cheng system of Baguazhang as well as circle walking Nei Gong exercises. The issue of gender impacts upon every facet of what we do and who we are. More than just a classification based upon biological differences, men and women have unique energetic and spiritual qualities which are a manifestation of the powers of Yin (陰) and Yang (陽). Within the eastern arts it has long been understood that men and women have individual traits which must be worked with in the correct manner if they are to successfully progress towards a higher state of conscious transcendence. Though the ultimate aim of such practices was to rise above any sense of division, the path to this point was through embracing differences and learning how to work with them. For this reason there has long been individual nuances in the way in which men and women practitioners of the internal arts should approach their training. In ancient texts we see countless references to female-practitioners and deities. Such eminent followers of the way as Xiwangmu (西王母) who is often known as the ‘holy mother of the west’. Another important female practitioner is Shengmu Yuanjun (聖母元君) who is the ‘supreme sovereign mother’ and, according to some traditions, was Laozi’s (老子) mother and original teacher. It was long known that women were naturally closer to the ‘source’ of all existence than their male counterparts. Indeed, within many Daoist tradition’s it is states that in order for men to progress successfully they must learn how to ‘become like women’. This all changed as Daoism developed and become more male-orientated. Men dominated the teachings, the writings and the practices. For a long time women were forbidden from training in anything spiritual in nature and even when they were allowed to practice they were forbidden from writing anything down. The result of this is the watering down and losing of women’s teachings. It is important now that women with an interest in the internal arts once again begin to understand the nature of their own energetic flow and learn how to work with their internal environment. Whilst the core of Daoist teachings may still apply to both genders, their are many women-specific nuances to the practice which female followers of the way will benefit from learning.